Last Friday marked the pre-film-launch in Canada for Frankenweenie, and Walt Disney Studios partnered with Play Taxi Media, Vancouver, for a marketing campaign for the film that will open in theatres across Canada Oct. 5/12. 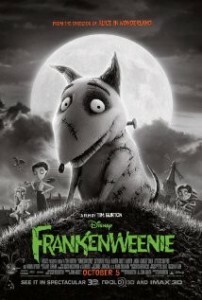 As Play’s first movie studio partner, Walt Disney Studios offers Play’s riders the opportunity to interact with the film directly by providing a myriad of engaging elements including broadcasting the full length Frankenweenie trailer and providing an interactive version of the movie’s website, complete with movie gallery, synopsis, character bios and an interactive puzzle game. “We feel privileged and excited for the opportunity to help promote this film and look forward to fostering an ongoing relationship with Disney,” says Zac Killam, Play CEO. Besides the in-taxi ads, the campaign includes TV, online and out-of-home. Media for the campaign, which runs to Oct. 5, was handled by Carat. This entry was posted on Monday, September 10th, 2012 at 10:00 @458 and is filed under Scuttlebut. You can follow any responses to this entry through the RSS 2.0 feed. You can leave a response, or trackback from your own site.